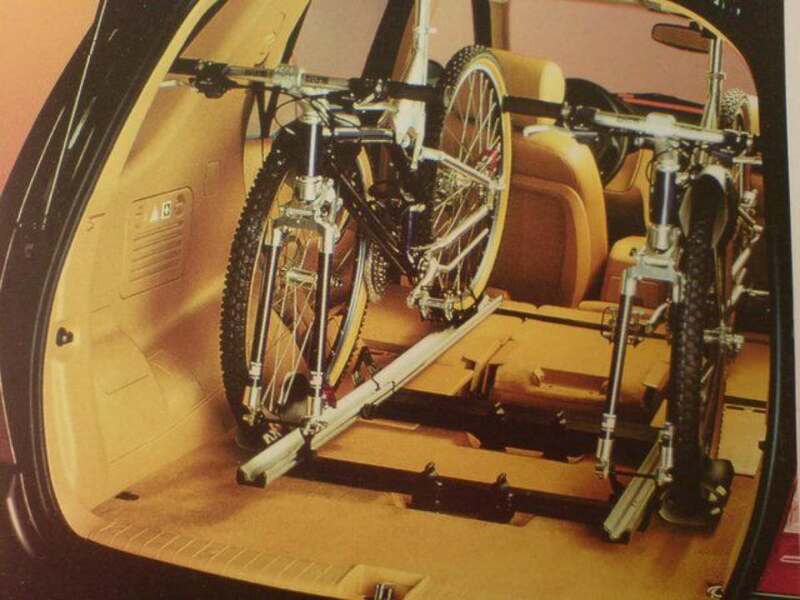 A genuine M-B accessory, this is the ultimate in bicycle racks, holding two bicycles in the interior of the car. Simply fold down the rear seats and install the rack on the mounting points fitted as standard in the floor of the ML. Remove the front wheel of the bike and position the bike in the rack; lock the front fork in place; strap the rear wheel in place and then secure the frame with straps provided. Repeat for the second bike as required. Even with two bikes in place there is still plenty of cargo space remaining in the back of the car. The real advantages of this rack are (a) the bikes are secure from theft (b) they’re not exposed to the elements and (c) the aerodynamics of the car are unaffected. When not in use the rack folds up for easy storage. The kit is complete with all necessary tie-down straps and is designed for the 1st generation ML (up to 2005).